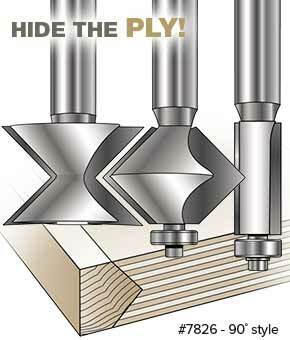 "Blend hardwood edging seamlessly with your project's plywood... using a pair of router bits." See the complete Woodsmith Magazine November 2013 review. Hide the Ply with an attractive edge! Add an attractive & durable edge to your cabinet doors and shelf edges. 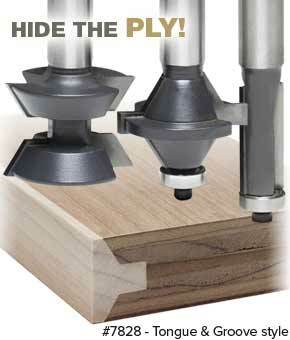 For use with plywood panels, MDF panels or shelves from 1/2" to 1" thick. All matched 2 piece bit sets are two flute carbide tipped. Simply center the male cutter on the stock and make the cut. Next match up the female cutter with the center point of the first cut. Finish by gluing together the two pieces and flush trim the edges, if necessary. Two styles are available. 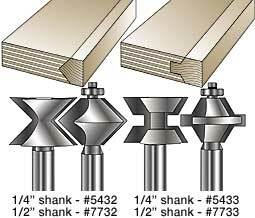 The 90° bits also make a horizontal V-groove or double sided chamfer. The 60° bits feature a tongue & groove for a larger glue surface area and easier alignment of edge banding. Recommended for use in a table mounted router. 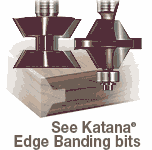 See Katana® Edge Banding router bits. I bought this set 2years ago, use them often and love the ease of using them. They sharpen easily. Their blades last a long time and if your not centered exactly, all you need to do is a quick planing to get things flush! This does make a strong and pretty edge but it is not a fast method to do it. These bits are hard to set up by the method shown in the video because they have to be perfectly centered on the work piece or the shoulders will be different widths and it won't work; it will leave a gap on one side of the finished panel. To make setup simpler, make a trial cut on one edge, flip it upside down and cut the same side again. If the bit cuts off more stock on the second pass, it isn't centered and you will have to raise or lower the bit. I, too, found out that the tear out on the plywood cross grain was bad. I wonder if it would be a good idea to make the tongue bit cut a a small shoulder perpendicular to the plywood face on each side. That would allow you to run the plywood directly against the fence, leaving the same small shoulder on the plywood, eliminating the need for taping a board to it. (By setting up the fence very accurately, I was able to eliminate that step but it takes a long time to do it.) I also found that trying to use the straight bit to cut off the excess didn't work very well. It helps if you have a fence on the table that you can raise up the width of the exposed portion of the male piece, allowing it to go under the fence. I finally just sanded them off with a belt sander. 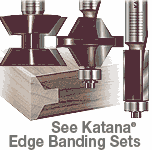 I just bought a set of the 7733 edge banding sets. I have pretty much used face framing and plate joinery to cover ply. Thought these might be a better way to cover it up. Boy was I wrong. I watched a tutorial to show how to set them up, which I followed, and the cuts were so far off it was ridiculous. Finally I worked out a way to get them somewhat aligned. This took over an hour and lots of scrap to achieve. Secondly the tear out with the ply groove cutter was atrocious. I tried changing router speed, feed speed, hold downs, passes through the blades, and ply. None seemed to work. While MLCS makes some good products, this is not one of them. I bought the 60 degree set a couple of years ago - works great. The finished product is virtually seamless! I just watched the instructional video online and I learned that when cutting the groove you need to place a scrap piece of wood on top as a guide against the router fence - otherwise the piece of plywood gets smaller and the edge may not be straight. I wish they had included instructions with set - it would have saved me a lot of headaches. Be sure to watch the short video online - it will make you a pro at this in no time. 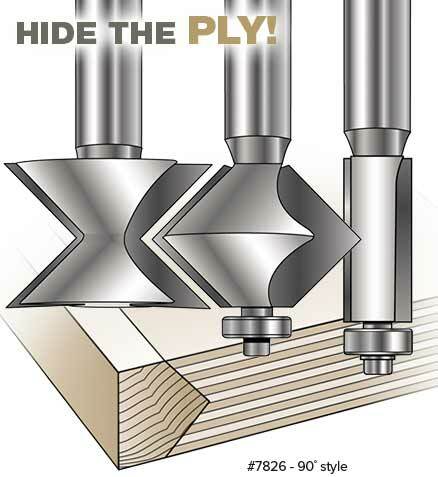 "Blend hardwood edging seamlessly with plywood... using a pair of router bits." SAVE $4! Put a finished edge on plywood shelves and doors. 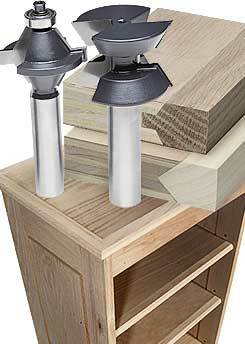 Use Edge Banding and Flush Trim bits together to add an attractive edge to cabinet doors and shelving. 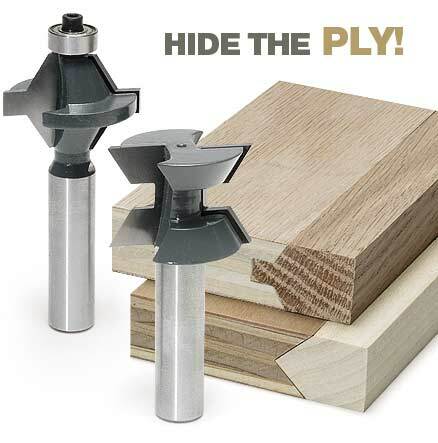 Cutting the joint with a matched pair of carbide tipped edge banding bits ensures perfect alignment of the plywood to finished edge. After gluing up the interlocking plywood and wood "edge strip" made by the Matched Edge Banding set, trim the edges with the Flush Trim bit. Make a strong joint and save money on materials. 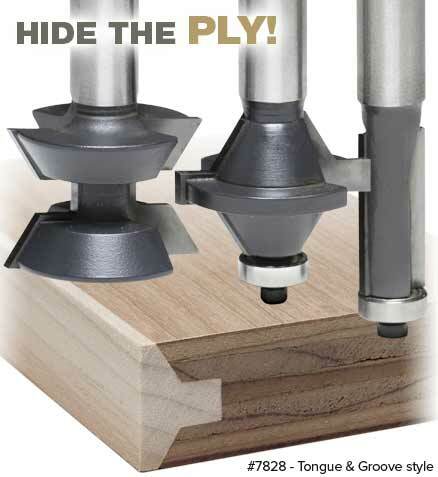 See the Woodsmith® Magazine Review. SAVE $4! Includes #7733 Edge Banding and #7804 Flush Trim bits. List $53.95. SAVE $4! Includes #7732 Edge Banding set and #7804 Flush Trim bits. List $48.95. I just set up my new edge banding bits and on the first try, after watching your video I got a perfect test fit. This is going to make the artists' taborets I manufacture so much better!! www.theultimatetaboret.com. I have the #7733 set, and love it! I also use it for making corner joints for Guitar speaker cabinets, by ripping a "2x4" into 1 1/2" X 1 1/2" corners, and matching the plywood end cuts for the cabinet sides to that. Makes a really STRONG corner joint!!! BE VERY CAREFUL during set up. The video demonstrates the 5433/7733 model which may be easier to set up than the 7732 model. Once you've 'tuned' the bits MAKE A TEMPLATE from scrap. Running 6 plus feet of material seemed to cause a very minor slip in my router height setting so template CHECK your set up after every pass. For wide shelf work it is not feasible to stand your work up when finishing off THE EXTRA MOLDING LIP with a pattern bit. take time to build a base plate for your router to run on the narrow edge also set the bearing at the 'lip' of the edge molding.